The Naked Lunch, Williams S. Burroughs' breakthrough novel which sparked the obscenity debates of 1965, remains an 'unfilmable novel' to this day. No film has been made of the novel itself, and no film can be made of such literary work. Cronenberg doubtless knew this when he embarked on his adaptation of the work in the 90's. He knew that Burrough's novel was a work which genius sprouted from its sintax. He knew The Naked Lunch is at its core a work about the written or spoken word itself: the violence of language, the brutality of hegemonies, the suffocating grasp of rational thought. He knew that for these reasons alone the book could afford to bring what "was once unspeakable" fully to light, albeit while trampling over the notion of literature itself. Yet, it is for these same reasons that Cronenberg's film adaptation, aptly called NAKED LUNCH, can achieve a great clarity of cinematic thought, and hence does not really adapt a literary work to the screen or even shows us the event of its writing but rather, more imperceptibly, records the process of inception and invention of art. In embarking on a project to film the 'unfilmable', Cronenberg emphasizes the very nature of cinematic thought: that of recording processes, of unveiling the verb, the transient within the stillbirth of hegemony, of the process of marrying or divorcing eternity, of the workings of time. And to do this, Cronenberg throws out big chunks of the material from Burroughs' novel to instead give us a portrait of a writer and the processes of his internal life that, in conflict with one another, create his words as much as deny what they're getting at: a writer's innermost self, an identity of the human being and his times. Reading Burrough's novel, specially the first time, one is left at bay to wander aimlessly without a plot or rational sintax to follow. One reads without the aid of memory. Watching Cronenberg's film one is immediately drawn into a straight story whose absurdity, comedy and tragedy surface from the relentless seriousness, the attachment to cause and effect, to a plot. Cronenberg shows us the narrative, however mythical, of a man's life in the process of being covered with words. The film itself is in a way the portrait of a certain witnessing of the transformation necessary life takes to become art. It is an imagined 'uncovering' of the great deception that is artistic creation. The film works so well because of the fact that all is seen to matter and intertwine in the same plane of reality: there is no mise en scene of fantasy vs. mise en scene of reality but only the juxtaposing of the two in moments of time. The writer's personal, inner life, and the tools of his trade, are present in an organic relationship that juxtapose the embracing and repression of desires. His work, in this case not just the novel but also many other writings, is not described, or merely faithfully represented, it is quoted. Some of the criticism directed at the film emphasized its lack of use of the material from the novel which it supposedly adapted, material that would point to a 'political' stance, an 'anti-rational' subversion, an opinion on the written word and literary style. It asks for reasons to have included so much of Burroughs' personal and social life and wonders if such inclusion rather makes the film crass, sensationalist, and without motive. Such criticism sees the relationship between film and literature as simply one of image to word, and feels rather that both are already given by Burroughs himself. In this case, a film, if it is to have a literary work as a source, has just to put physically on screen what is described by words in the most loyal way possible. This way it draws attention to the literary work and its social status, its canonization if you will. And yet, that is not the work of film. Even if given the film's remarkable set design and beautifully rendered creatures, its cinematic power really lies in the fluidity of its rhythms, tone, and source material. It turns the life of an artist, at a particular point in time, into a confession. It records the process of reporting, and is as such closer to an intimate portrait of an artist, the deceptions and sacrifices he makes to just begin his journey towards truth. It records a transformation. 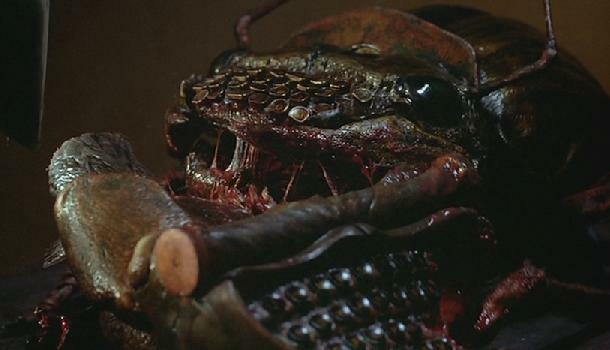 And the fluidity of transformation is at the heart of Cronenberg's art. His films, whether they include such wondrous graphic treatment of obsession and addiction as in DEAD RINGERS or NAKED LUNCH, or hide the phantasmagorical from sight, making it fully integral to the emotional life of the actor as in A DANGEROUS METHOD or SPIDER, revolve around the fears, struggles, denials and yes, politics, of the inner life in the process of transforming realities and histories themselves. If you live in New York I would strongly suggest to catch the David Cronenberg Retrospective at the newly renovated Museum of the Moving Image in Long Island City, Queens. There are many films left in the retrospective, among them NAKED LUNCH playing this Sunday afternoon.